Fancy verbiage aside, this kraut is light and tangy and perfectly springy, a perfect seasonal accompaniment to the light, vegetable based meals of spring, or as a refreshing counterpoint to heartier fare. Make it while the rhubarb stalks the market basket; otherwise you’ll have to wait all year before you can make it again. Chop the cabbage to the desired consistency, discarding the hard white center. Sprinkle the cabbage with salt and massage until the texture softens, and juice begins to run from a handful of squeezed cabbage. Chop the rhubarb into 1/2” slices, and add to the cabbage mixture. Add the zest and juice of 2 limes. Dice the ginger into tiny cubes, and toss to mix all ingredients. 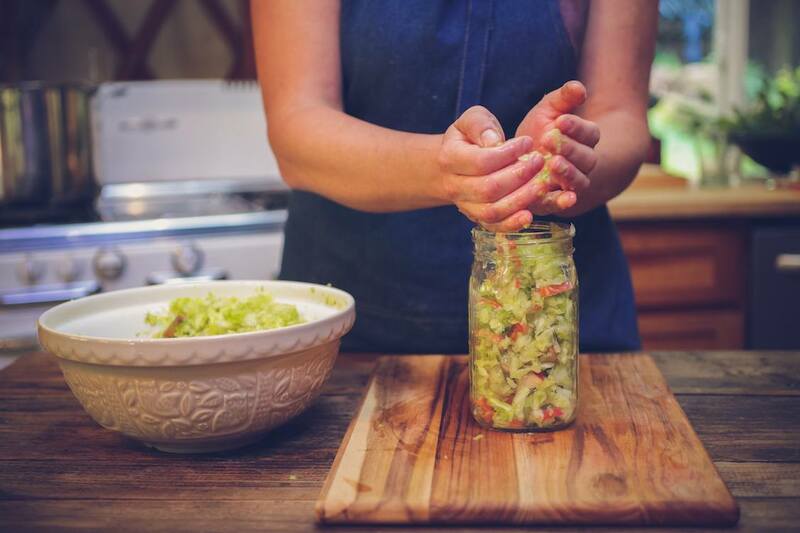 Pack the young kraut into a quart-sized mason jar; you should have plenty of brine, since the lime juice adds a lot of moisture to the mix. Weight the kraut; here, we show you our little secret: small Weck jar lids make excellent pickle weights. Secure the top with a jar-top fermenter of your choice; here, we are using the new silicon Pickle Pipe. Place out of direct sunlight at room temperature, and allow to ferment for 2 weeks, or until the desired flavor is reached. When fermentation is complete, the bright colors will have faded, alas, but the flavor will sing, as bright and tart as spring. When your kraut reaches the desired flavor, screw on a lid and refrigerate.